Three hundred miles up at two miles per second, then an 1,800-mile toboggan rideâ€”that will he the new transcontinental rocket. IN A RELATIVELY short time you may be able to have lunch in New York City, hop aboard an airliner, and have breakfast in Los Angeles the same day! The present seven-hour plane trip will take only 40 minutes. Let’s slide forward a few years. The place is just outside New York City on a cold, blustery day. Inside the passenger terminal, luncheon is being served in the restaurant. It looks like an ordinary airline terminal except for the signs over the desks: Transcontinent Rocket Lines, Atlantic Rocket Service and others. We check in at The Transcontinent Rocket desk where our baggage is carefully weighed â€”along with ourselves. Weight has always been a prime factor in rocket work. When our flight is called we rapidly finish our light lunch and head for the boarding gate. Now, its silver sides shining coldly, a huge rocket transport stands beyond the gate, 80-foot delta wings spreading over the concrete ramp. Three rocket nozzles gape from the rear of the ship. It looks more like a very fast jet plane than a rocket. 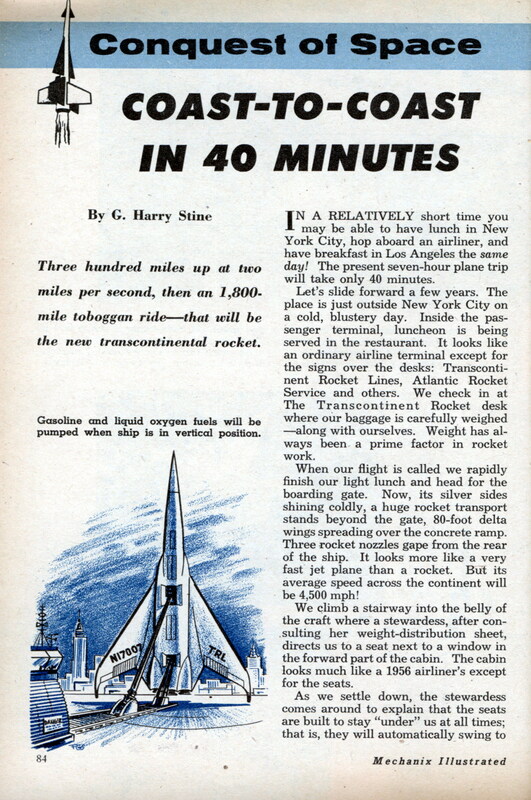 But its average speed across the continent will be 4,500 mph! We climb a stairway into the belly of the craft where a stewardess, after consulting her weight-distribution sheet, directs us to a seat next to a window in the forward part of the cabin. The cabin looks much like a 1956 airliner’s except for the seats. As we settle down, the stewardess comes around to explain that the seats are built to stay “under” us at all times; that is, they will automatically swing to support us under the terrific accelerations of the ship. Then the belly hatch is closed and the ship is towed out onto the big field by a tiny tractor. It stops next to one of the big concrete flame pits, partially filled with water, which cool the rocket flame during the take-off to prevent it from damaging the ship. The ship suddenly tilts up, being lifted to the vertical position by a device much . like those used for the same job with big guided missiles. Within a minute, the transport is standing vertically on its wing and rudder tips over the flame pit. Then the ground crew is swarming over it, attaching big hoses through which the rocket propellantsâ€”liquid oxygen and gasolineâ€”are quickly pumped into the ship. Over 60 tons of propellants are put aboard, more than two-thirds the takeoff weight of the ship! Our watches show it is 11: 50 a. m., New York time. The ship is now ready to go but the pilots up in their cabin must still complete an elaborate set of checks and tests. Once the rocket transport is on its way, there will be no turning back. We are securely strapped into our seats which have swung so that we are now lying on them. “Thirty seconds!” Things start happening. There is the high whine of motors and gyros, the hiss of pressurized gas, the muffled slam of valves. And: “Zero!” A thundering, muffled bellow assaults our ears. The rocket motors have started as scheduled, on the dot of noon. There is a slight vibration, then we are being pushed into our seat-couches by a tremendous force. If we could watch, we would see the ground slip quickly away, the clouds slide by and the sky growing progressively darker. But the acceleration of the ship has us pinned to our seats. It is, however, only a force of about three g, and men have taken much higher acceleration without discomfort. The rocket motors keep burning for only two-and-a-half minutes. Once the proper speed has been built up, the rocket motors stop and the ship coasts upward like a giant artillery shell, aimed across the continent. At this point, the ship is moving at nearly two miles per second and is about 100 miles up. We have been given the same two-mile-per-second velocity as the ship, and when the motors stop, we coast upward with the ship. And we suddenly feel ourselves falling! But we are falling up with the ship. So we do not detect gravity. We are * in that strange state known as sub-gravity, or free-falling. We have no apparent weight. This does not cause discomfort; two decades of experiments by test pilots and flight surgeons have preceded this trip. Even back in 1955 they had learned that zero-gravity does not bother a person provided he is strapped down as we are. cloud banks below shine pure white, reflecting sunlight. Now we are falling back toward the ground somewhere over Illinois. Ordinary test rockets would come screaming in to hit the ground if they were making such a flight. But, thanks to some research conducted by Dr. Hsien-Tsien at the California Institute of Technology, we will not crash. Back in 1949, he laid out the basic course or trajectory we are now flying. At about 25 miles altitude, there is just enough atmosphere outside so that the bat-like delta wings can begin to have effect. They lift. Rudders and ailerons are effective again. Air streams past the ship, more and more of it as we dive deeper into the atmosphere. Then our seats change position again and the pilots bring us slowly out of our dive and into level flight. The big transport slices through the upper atmosphere; it is now a supersonic glider with its nose pointed toward Los Angeles. Falling from 300 miles altitude has given us enough speed to glide the remaining 1,800 miles to the West Coast. The Great Plains of Kansas are under us now, wrapped in the thick of a blizzard of which we can see only the distant tops of the clouds. The high Rocky Mountains are under us in a matter of minutes. They look like tiny wrinkles in the surface of the greenish-brown earth. The leading edges of the wings are glowing red-hot from the compression and friction of the air at this tremendous hypersonic speed. But their high-temperature alloys will not melt away. Were there not 25 years of rocket research behind us we would be in trouble because the ship has been encountering the so-called thermal barrier ever since it got back into the lower portions of the atmosphere. Air conditioning keeps the cabin temperature comfortable. The Earth loses its apparent curvature quickly as we pass over Nevada. Up forward, the pilots are vectoring on Los Angeles with radar and talking to the rocket port tower there by radio. Then the Sierra Nevada range slides beneath us and we can see roads and fields and towns again. The ship slows noticeably as the big flaps and air breaks are extended. Then the big landing gear drops out of the fuselage . . . and we are over Los Angeles, still gliding, but heading for a landing under the controlling hand of the great-grandson of the GCA instrument landing system. There is a squeal of tires as the ship touches the runway and the big drag parachute billows from the tail of the ship, dragging us to a quick, smooth halt. We are down in Los Angeles. The time is 12:40, New York time. The sun over the eastern horizon tells us something else, however. It is only 9:40 a. m. here in Los Angeles. We have raced the sun across America and won! Such a rocket flight is not a fantastic dream to the men who are working with rockets today. In the midst of all this research, rocket men can foresee a time when such a rocket trip from coast to coast will be a reality. There are problems remaining to be solved, certainly. But they are engineering problems and they can be solved. After that it will be only a matter of building “hardware” and making tests. Interestingly the Germans had this idea in the 30’s — launch in Germany, bomb the US and land in Japan. Torgo, was that the Antipodal Bomber? Eugene SÃ¤nger, an Austrian, propose a combination of aircraft and rocket technology as the best and easiest way to get men into space. In the 1930’s he did systematic mathmatical studies of rockets for long range and space travel. During the Second World War while working for various German aircraft research institutes he solidified his design for the Silverbird Antipodal aircraft. The idea was for the Silverbird to skip on the upper atmosphere like a stone skips on the water. The flight plan outlined in this article is more like that of the X-15. What’s the octane on the gasoline??? Tetraethellead was added to gasoline to reduce engine knock. I don’t think Rocket Engines do that, so it wouldn’t be required. The Saturn S-1 used Kerosene and Liquid Oxygen. 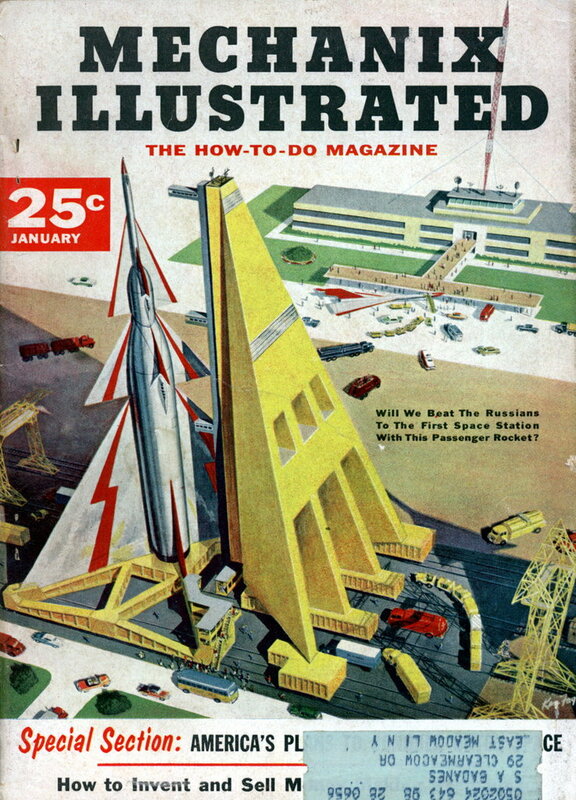 Talk, talk, talk that’s al we’ve seen about suborbital rocket transportation since the 1930s. So what are we the people waiting for? National leadership? Build the damned rockets and let’s go. Don’t look for this White House for future vision. The private sector needs to drive this in the New Age of American Navel Gazing. Which means tens of thousands of dollars per passenger. The Concorde couldn’t show a profit from NYC to Europe. Who would these passengers be?